See how AMSOIL synthetic motor oil performs in rigorous testing. We rigorously test our products to ensure you receive the highest quality synthetic lubricants on the market. AMSOIL Signature Series Motor Oil was subjected to 200 hours of use at 302°F- 100° higher than normal operating temperatures- to measures its ability to prevent wear, deposits and more. Most motorists now understand that synthetic motor oil performs better than conventional oil. It delivers improved wear protection, offers better engine cleanliness and lasts longer. 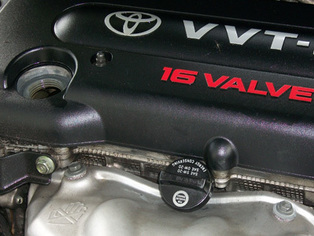 Not as well understood, though, is how often you should change synthetic motor oil. Not long ago, it was common to change conventional oil every 3,000 miles/3 months. The practice originated in the 1960s as a way to time oil changes with the seasons. The quick lube market picked up the idea as a way to keep traffic flowing, touting it as an “insurance policy” for your engine. Improvements in motor oil performance and engine technology have since rendered that guideline outdated. The advent of electronic oil life monitors struck a first blow. GM introduced its system in 1988, and it’s now on tens of millions of vehicles. The state of California has aggressively campaigned against changing oil every 3,000 miles, calling it wasteful. The final stake in the heart of the 3,000-mile oil change came in 2011 when Jiffy Lube, the face of the quick lube industry, abandoned the practice, advising motorists to follow the guidelines in their vehicle’s owner’s manual. If synthetic oil performs better, it should last even longer, correct? The fact is, most oil manufacturers don’t recommend a service interval for their products. They generally advise you to follow the oil-change recommendation in your vehicle’s owner’s manual, likely due to most motorists’ unwillingness to go longer between oil changes than what’s recommended in their owner’s manual. Why spend more money on synthetic oil if it doesn’t last longer? Improved wear protection – Synthetic oils are more durable than conventional oils. They form a stronger protective film between metal components to shield against wear. 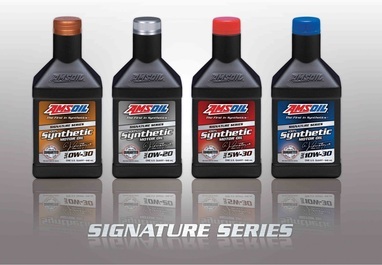 AMSOIL Signature Series 5W-30 Synthetic Motor Oil, for example, provides 75 percent more engine protection against horsepower loss and wear than required by a leading industry standard*, extending the life of vital components like pistons and cams. Maximum extreme-temp protection – The average operating temperature of a passenger car/light truck engine has risen to 235ºF, and higher under heavy loads. Synthetic motor oils do a better job of withstanding extreme heat, while their improved fluidity in cold weather helps the oil reach components faster at startup for reliable wear protection. Many vehicle manufacturers now require synthetic oil – Automakers understand synthetic oils help their vehicles deliver improved performance and last longer. That’s why newer Toyota, GM and European vehicles, among others, use synthetic motor oil. Not only that, but some synthetic oils, such as AMSOIL extended-drain synthetic motor oils, protect so well you can go longer between oil changes if you choose. Many motorists want to follow the guidelines in their vehicle’s owner’s manual. 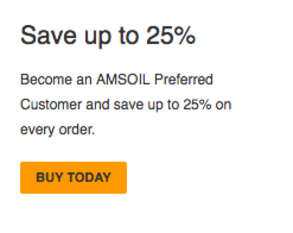 But lots of them still choose AMSOIL products that are capable of extending drains because they simply want maximum protection for their vehicles or the comfort of reserve protection should maintenance be delayed. Others desire the convenience of a once-a-year or twice-a-year oil change. For these motorists, AMSOIL Signature Series Synthetic Motor Oil is guaranteed for 25,000 miles/12 months (15,000 miles/12 months in severe service). AMSOIL XL Synthetic Motor Oil is guaranteed for 10,000 miles/6 months, or longer where recommended by electronic oil life monitoring systems. They offer an outstanding combination of performance and value. And, practicing extended drain intervals won’t void new vehicle warranties. The Magnuson-Moss Warranty Act protects you in these situations. 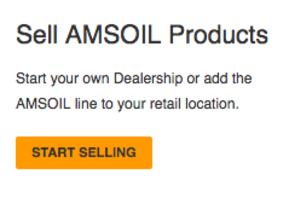 Plus, the AMSOIL Limited Warranty provides an extra measure of confidence. For details, visit www.amsoil.com/warrantysecure. 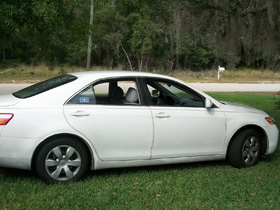 Preferred Customer Gordon Armstrong lives in Florida and drives a 2007 Toyota Camry. It has a little more than 100,000 miles on the 4-cylinder engine. At 86, Armstrong describes himself as a "semi-retired" mechanic, who is familiar with vehicles and engines of all kinds — and what happens to them if they are run without any oil. Armstrong recently did a "turn-around trip" from his home in Florida to Indiana, a weekend that logged 1,950 miles on the Camry's engine. Before the trip, he installed fresh AMSOIL Signature Series 5W-30 Synthetic Motor Oil. During the trip, Armstrong said, his daughter said she thought the oil light was on. "Oh, it's probably one of those idiot lights to check the engine," Armstrong responded. right where he had left it after an oil change 1,900 miles earlier. His 2007 Toyota Camry still runs sweet thanks to AMSOIL motor oil. He immediately put in two quarts of synthetic motor oil at the station, and another two quarts when he got home. He realized he forgot to put the oil cap back on when he changed the oil before the trip.